Whaler entry, Area + Weather, Route+Dates, General info, Raid Logistics, Rates, Registration, Ts&Cs, Maps, Pictures. Wed 18th to Sun 22nd September 2019. Registration opened 20/1/19 and is already full - but "Molly" might have spare space - See below. This popular Sail-and-Oar Raid is organised by natuurlijkvaren.nl. This page is based on the organisers' website, previous experience, and a Dutch presentation (or here). A video by Dirk B.
Henley Whalers' participation in 2019. Curently 6 "Henley Whalers" going, and as many "Guests"
Bay Raider 20 "Llafurio" will be sailed by SM + 2 crew. Whale-boat "Molly" has 9 crew. Want to go on the "Reserve" list? enquire here - We are hoping for more spaces. You may need to "camp" on Molly or Llafurio, but can enjoy the full meals package and the hotel barge facilities. [Added 20/3/19] "Guest Crew" - Delighted you will be joining us. We'll aim to offer a familiarisation sail before the event. This will be preceded by some on-line introductory material, announced by email when ready. Sailing area - Northern Netherlands. 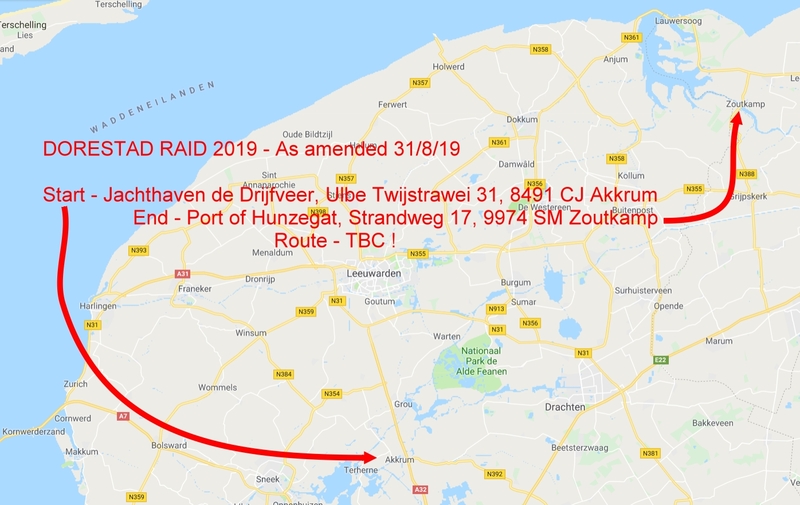 "The Dorestad Raid 2019 will start in Echtenerbrugge. - (Map below). Historically interesting - "At the border" between the different provinces of Friesland and Overijssel; "old" and "new" country; - Fantastic natural Beauty (River de Kuinder or Tjonger, National Park Weerribben-Wieden. The Raid ends in Blauwe Hand". Hotel barge "In Dubio will again accompany and pamper us"
Weather in in Emmelord by "TWO". Wed 18/9: Afternoon/early evening, launch boats at Echtenerbrugge. - Map below.- Raid Logistics below. A short cruise to where the hotel barge In Dubio is moored for the night. 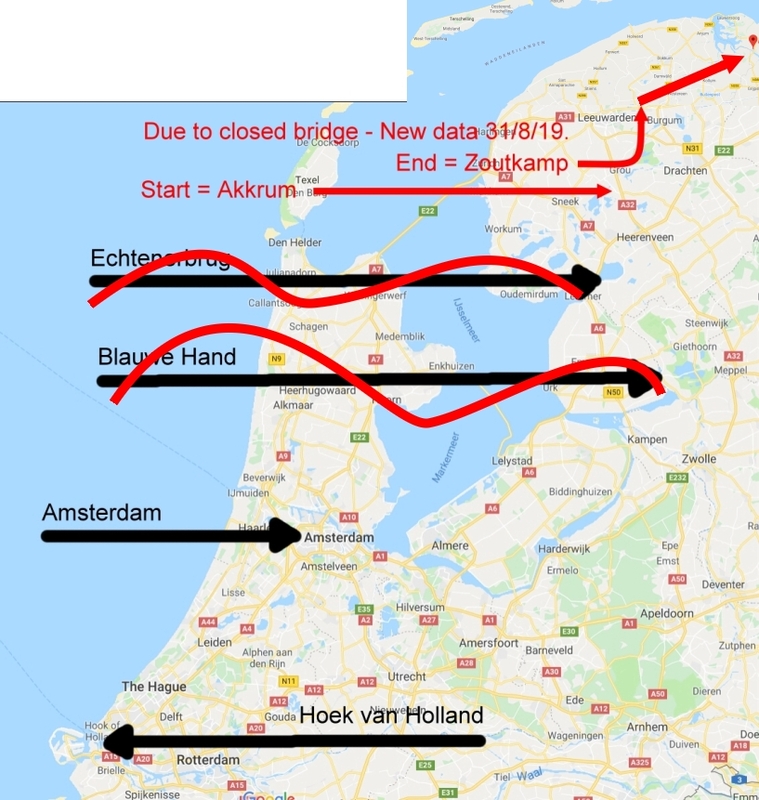 Thu 19/9: Echtenerbrugge to Ossenzijl. Fri 20/9: Ossenzijl to Blauwe Hand. Sun 22/9: [TBA] There is typically a short cruise before going to the slipway. - Map below. General information - "Algemene Informatie". "The Dorestad raid takes place annually from Wednesday evening to Sunday afternoon in September, each year taking a different route in the Netherlands. Participants are to complete the entire route without the use of an engine. Playful competition elements are inevitable, but it is not a real competition. The most important thing is that all are enjoying themselves. Each day there is a stage which all participants should be able to complete, if necessary with some assistance. All however having due regard for the Terms and Conditions and the Safety Points. In the morning there will be a briefing explaining the stage for the day and what you can encounter along the way. Each day ends in afternoon at the place of destination, as agreed in the morning briefing. At the place of destination one will find the accompanying mother ship, the accommodation barge the ‘in Dubio’ of Leo and Hannah Versloot. The price includes the evening meals, breakfasts and packed lunches, coffee and tea. Other drinks must be paid separately. All participants are, in accordance with the cores schedule, to help once during the raid setting and clearing the tables as well as doing the dishes. Please indicate your dietary requirements on the registration form. For an additional price one can sleep on board the ‘in Dubio’. If so desired, bed linen is offered at an extra charge. Everything is to be specified on the registration form. Please also note the Terms and Conditions and the Safety Points"
The following is translated from the presentation (in Dutch & here). And Bringing away [=taking] cars/trailers to the finish port (37.5 km/35 minutes one way). A detailed plan has been elaborated. We want to invite participants to arrive on time so we can still bring the cars and trailers to Blauwe Hand - 16.00 departures per Convoy from Delfstrahuizen - [Convoy leaves Delfstrahuizen at 16:00]-a bus takes us back to the boats. For latecomers an alternative is regulated. We transfer the luggage with the small boats. If bad [weather], we will [ask] covered boats ask if they can offer a solution/ [help]." Raid fee - .€ 250 if you sleep on your own boat. € 300 if you sleep on the "In Dubio". + Bed linen: € 12.50. Coffee and tea are included, as well as breakfast and lunch, and dinner Wednesday, Thursday, Friday and Saturday. Henley Whalers and friends will also need to cover the costs of boat towage (our non-commercial vehicle) from Henley to/from the event, and their own transport. We usually car-share and go by ferry = Harwich /Hoek van Holland. Some folk have used train / tunnel / plane / even bike! Registration - (in Dutch and English). "Henley Whalers" and friends contact PW via our "Enquiries" link or my email. Number of eaters: max 40 persons. Cabins: max 25 sleepers on 'In Dubio'. (Otherwise you can sleep &/or self-cater "on own boat" alongside). Safety Points - Read them here > "Veiligheidsaandachtspunten"
Click arrows for zoomable map of locations. Days 3 & 4 not yet announced. 2018 - Whalers' pics (some). - Video by DirkB. Other Crews' pics. Their report & more pics. 2017 - Whalers' pics*. Other crews' pics. 2016 - Whalers' pics. Other crews' pics. 2014 - PW's pics. Other crews' pics. 2011 - PW's pics . Other crews' pics. 2009 - CB's photos are here . Video here. 2007 - Whalers' pics. Other crews' pics.